If you are an active ChopCult member, you have heard of Mikey Arnold and are familiar with his work. Not only is he a very talented photographer, but he is the driving force behind Forever The Chaos Life and now the successful Fuel Cleveland show. I was fortunate enough to be invited and attend this event in Mikey’s hometown. Although it was the first year for the show, it was well planned and a huge hit. 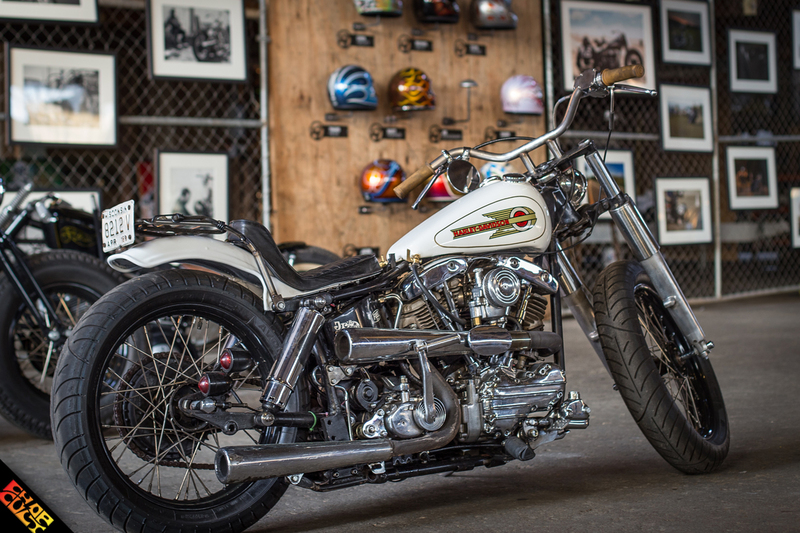 I’m glad I made the trip to see some amazing photography, original artwork (both traditional and of the helmet variety), and custom and vintage bikes from all over the country. Since this was a Mikey event, all the details were covered; custom name plaques for all bikes and artwork, promotional shop rags with a vintage Harley-Davidson logo, and even an old “recycled” mattress repurposed into event signage. I caught up with Mikey to get his thoughts on the show. 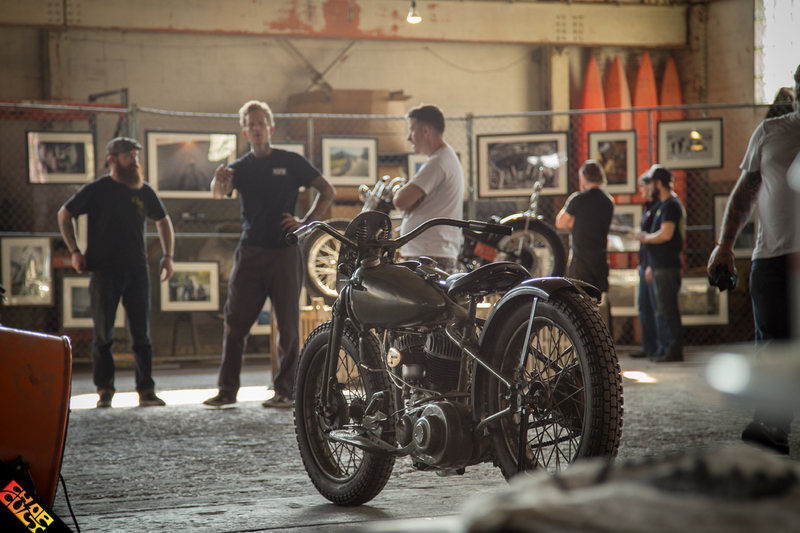 This was the first year for the event, what was the inspiration and how did the idea for a motorcycle photography show come about? I have always wanted to do a photography show of my own work. I take so many damn pictures that I know I could fill an entire space with all my work. But I never could really find the right venue nor a really good time to do it. When I was at Brooklyn Invitational last year I walked around taking photos of bikes and drinking it all in. I noticed the whole art gallery feel to the show, but not a lot of art on the actual walls. I went up to my friend, Jesse Basset (the Gasbox), and asked him, "How cool would it be to do something like this but with my photos and your bikes?" He said, "I know all kinds of people that have huge warehouses we could do something like this in. 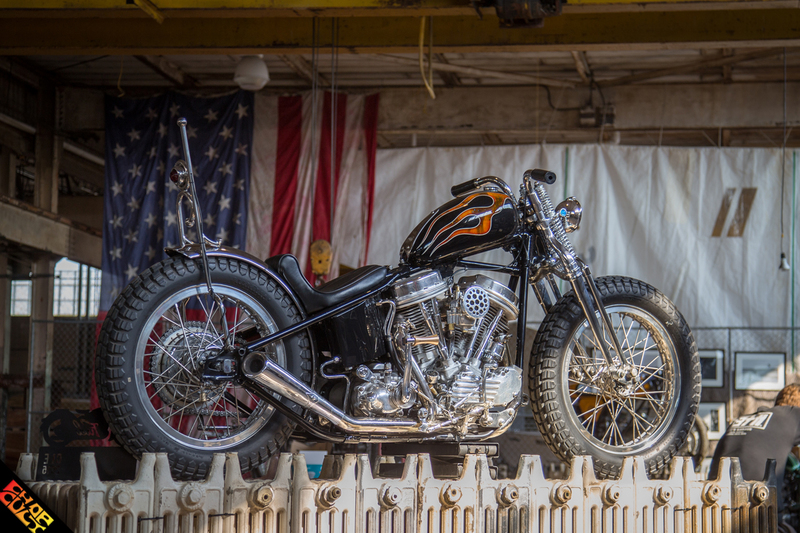 Let's go talk to Tyler (Lowbrow Customs) and see where he might think would be a good spot. Maybe he might want to be a part of this." 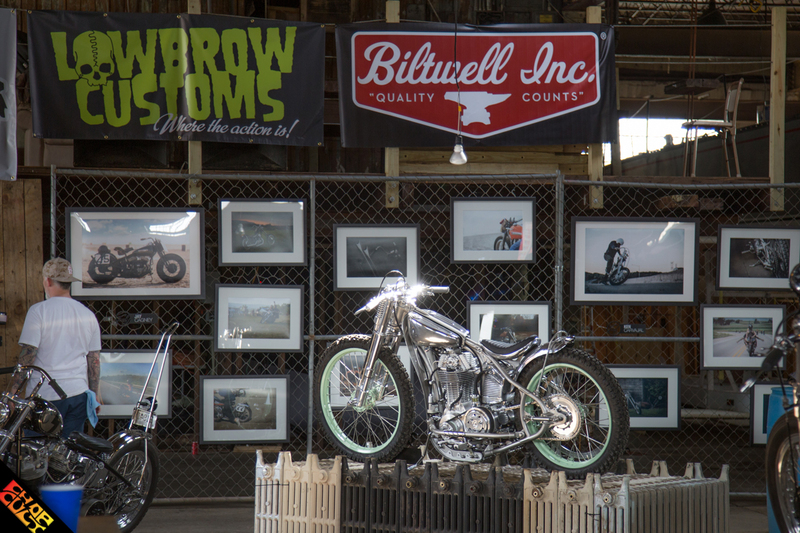 A little idea of having some of my photos and a few of Jesse's and Tyler's bikes in an art gallery setting soon exploded into the monster idea of having an invitational show for all kinds of photographers, builders, rare bike owners, and painters. Fuel Cleveland was born right there in Brooklyn, though we didn't have the official name until months later. How were the photographers, artists, and builders chosen? I, personally, was in charge of picking all of the photographers. It was pretty easy due to the fact that, over the years, I have come to know most of them pretty well. I absolutely love all of their work so much. I think that was the easiest part of the show. Ahaha, Tyler and Jesse were in charge of inviting most of the builder and rare bike owners. I contributed a handful of them and we all contributed on the painters. You had top sponsors for this event. Considering this was the first year, was it a tough sell? Over the years, my relationships with Harley-Davidson, Chop Cult, and Biltwell have been nothing but the best and always growing. 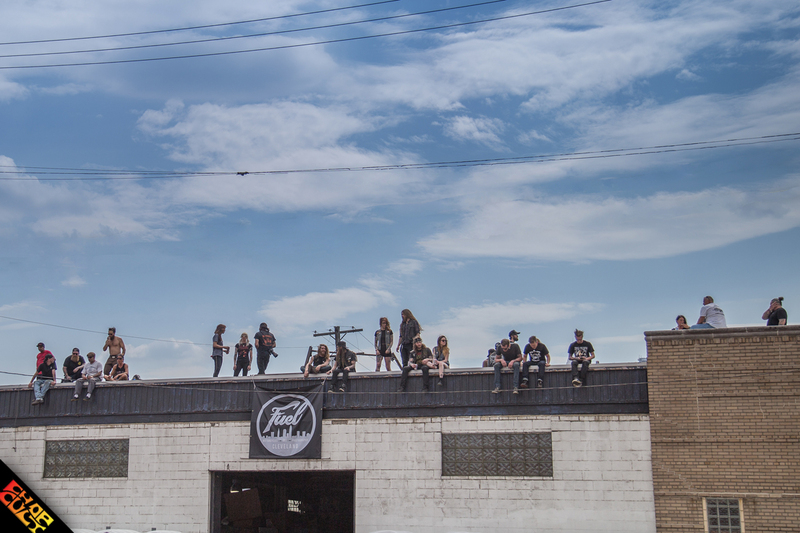 To have them on board with this show was a win-win for everyone and we are incredibly grateful here at Fuel Cleveland for all of their love and support. As always with your work, the graphics and printed material were on point. Did you do this all alone or did you have a little help from your chopper contacts? Tyler, Jason "longhair" from Lowbrow Customs, and my wife Kat had a lot to do with the overall graphics, logos, and design/feel of the show. All four of us worked closely to keep the overall look fluid and cohesive throughout all aspects. The venue was perfect for the show. How did you come across such an appropriate location? Jesse worked with the owner of the building a few times on other projects and thought of the spot right away. It was the first place we looked at and right when we walked in, we knew that was the spot. What was your favorite part of planning the event? And the most challenging? Favorite part of planning the event? There's a favorite part? Ahaha, no I'm kidding. I really enjoyed interviewing and talking to a lot of the invited parties that were coming to the show. Learning about them, their own history, and about their craft etc. Most challenging has to be making sure everyone is always on the same page. There are a lot of moving parts when it comes to a show like this, but it came together almost flawlessly. Are any of the photographs, helmets, or artwork still for sale? Yes, I believe so. Feel free to email anyone in the show. I bet they would be willing to part with their featured pieces from Fuel if the price is right. Clearly, the show was a huge success. Will this be a yearly event? Any things that you may change going forward? Thanks man, it was such a good feeling to see the smiles, laughter, and people in awe over all the helmets, bikes, and photos. We are definitely doing this every year! I'm sure there will be changes! I do know one thing is for sure: Kat and I don't want to put 160 frames together by hand ever again! Ahaha! Where can we find more information about the event and next year’s show? 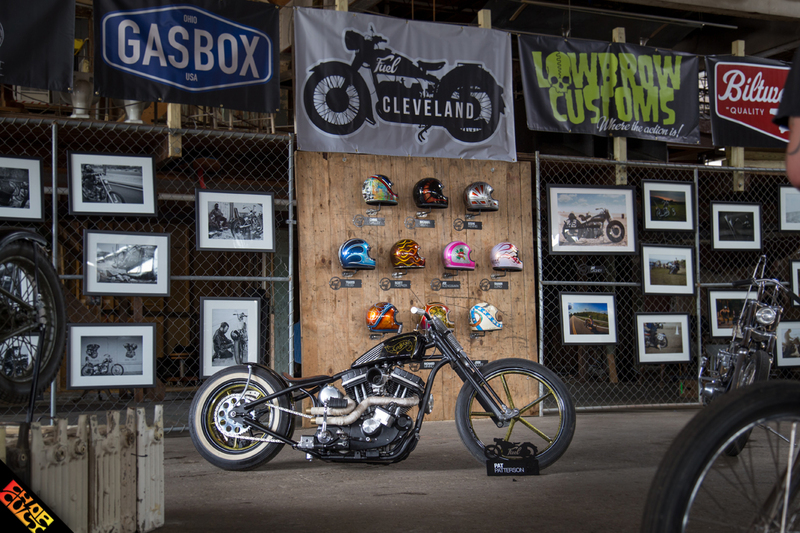 Keep checking our website FuelCleveland.com We will be posting features and information about the show, changes and the new invited parties for next year. Anyone you’d like to thank? First off, I want to thank Tyler and Jesse, without those two Fuel Cleveland would still just be a dream. I want to thank my lovely wife, Kat, for all her hard work, helping me proofread countless articles, framing, cutting up mats, and dealing with my stressed out self over the past few months! This show was incredible! Cant wait til next year! !